In starting brand new with the Year of the Horse, the CCC Lion Dance Troupe were all ready for the busy Chinese New Year ahead. Members have all been training hard in preparation of the new year, as well new uniforms and lion heads have been made for the new year. The troupe started their performances at the Hsu residence. They then performed at a number of businesses and Chinese New Year office parties. Companies included Bankwest, ANZ, Richard Yeohs office and Westpac. Of course in continuing the large fire cracker display tradition, the troupe performed at Good Fortune Duck, where firecrackers filled William Street with loud noise of celebration. 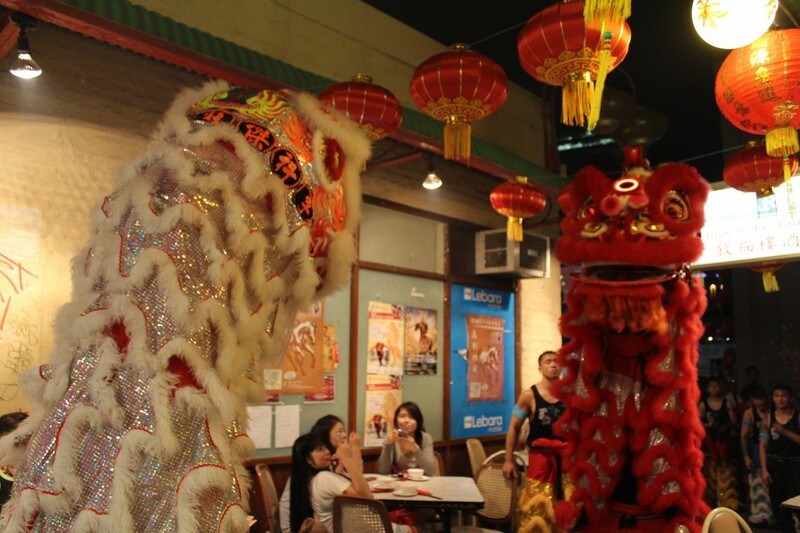 During the night the troupe performed at a number of restaurants in which were fully booked out for Chinese New Year. All who were able to watch the lion dance performances of the troupe were all in the festive mood of Chinese New Year, in taking photo with the lions and feeding the lions red packets. The mood of the members were all at a high with members, although having a non stop busy schedule, were all smiles enjoying performing with one another, performing for the audience, and of course being able to be togethor for Chinese New Year. The first day of Chinese New Year couldn’t be any better. 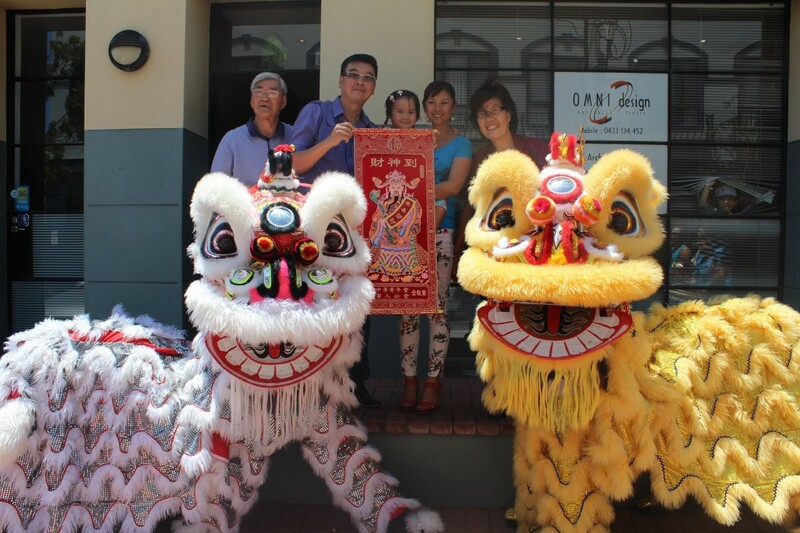 We all here at the CCC Lion Dance family all wish everyone a happy Chinese New Year, Year of the Horse! 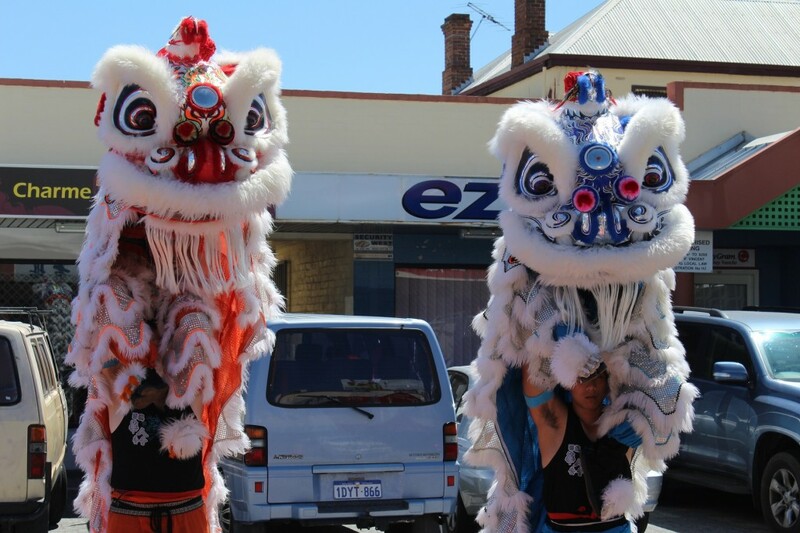 Ending the year of the Snake, The Chinese Community Centre Lion Dance Troupe were fully booked for performances at restaurants where on this day families have their reunion dinner in ending the year and welcoming the new. 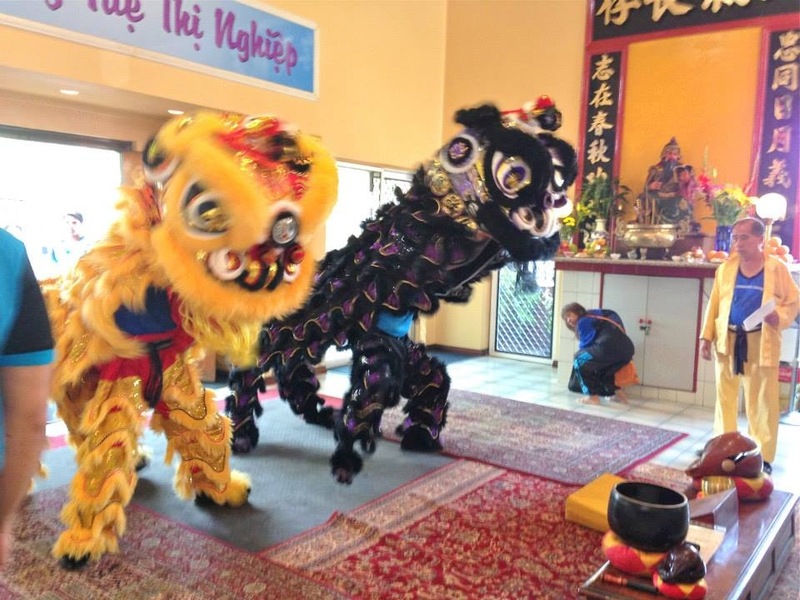 The CCC Lion Dance Troupe started their performance at the Broadway Chinese Restaurant. The troupe then performed at a number of restaurants in Chinatown where there were large crowd of spectators getting into the festive season of Chinese New Year. 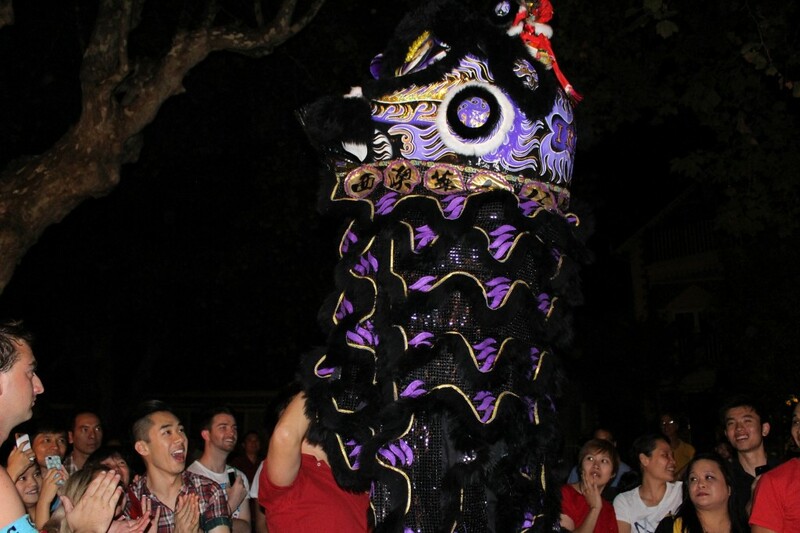 In tradition of ending the year and starting the new year, the CCC Lion Dance Troupe finished their performance for the night at the Money Street Temple. This was not only significant in the sense of performing in welcoming in the new year but also performing for Robbie Chau, a member who has passed away and now rests at this temple. A new routine was put togethor for Robbie in which his signature lion dance movements were incorporated into the routine. In addition, his tribute lion was used as the main lion. The performance was enjoyed by all of the audience, great signs of what is ahead of the new year. The performance finished with the troupe bowing to the audience, and then bowing to their fallen brother and to his family in attendance. Warming up to the Chinese New Year period, the CCC Lion Dance Troupe performed at Joe’s Oriental Restaurant at Hyatt Hotel. 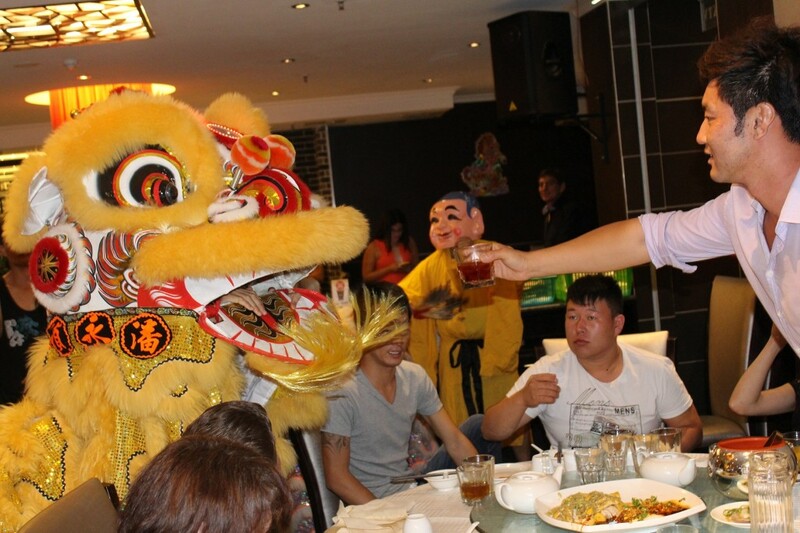 The Lions surprised the guests with the performance, with the lions roaming through the restaurant; interacting with the audience, and blessing the restaurant staff by throwing the lettuce at the staff. The staff at Joe’s Oriental has booked the troupe throughout the CNY period. We hope all the staff and guests enjoyed the performance and gave you all a teaser of CNY. 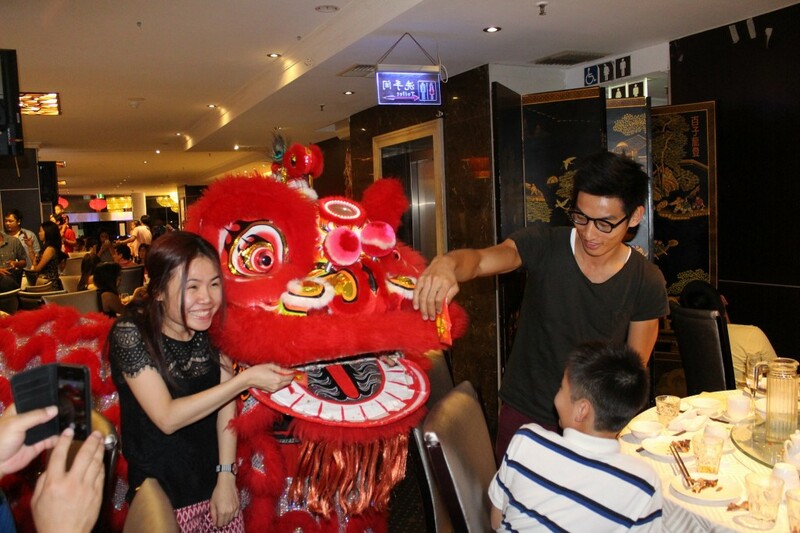 The Chinese Association celebrated Chinese New Year with a function held at Dragon Palace Restaurant. 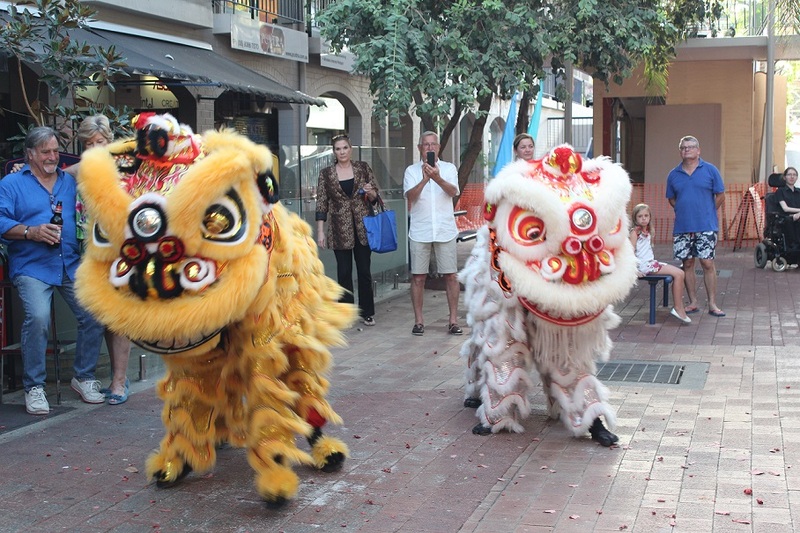 To start the event, the CCC Lion Dance Troupe performed the lion dance with 3 lions entering the restaurant with the loud musical band. The Lions blessed the guests by interacting with guests and eating the “ang pows” offered by the guests. The Lions then presented a good luck scroll to the president of the association wishing him and his association a good and prosperous new year. 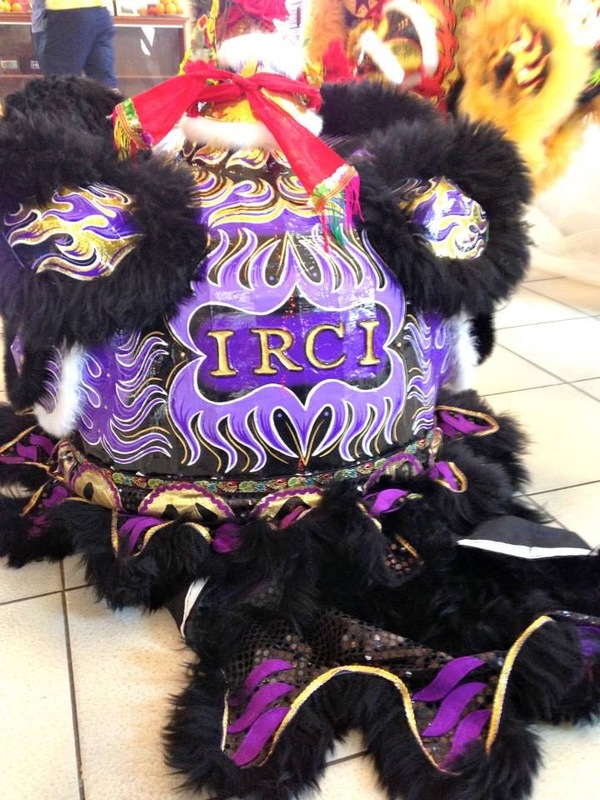 In 2013, one of the CCC Lion Dance Troupe’s senior members, Robbie Chau, passed away. Robbie Chau was one of the members who made endless contributions to the group in which made the group successful at it is today. To show our endless love to Robbie, and to continue his lion spirit in which he will always be with the troupe, the CCC Lion Dance troupe designed and donated a memorial lion for Robbie, with his personal initial design proudly placed on the back of the lions head. The opening ceremony of the lion was held at the Money Street Temple, the temple where Robbie is rested at. The ceremony was attended by Robbie’s family and close friends. After the Lion was dotted and brought to life, the lion made its way to Robbie’s alter where it bowed 9 times to him and performed for him. The lion then presented a scroll to his family. 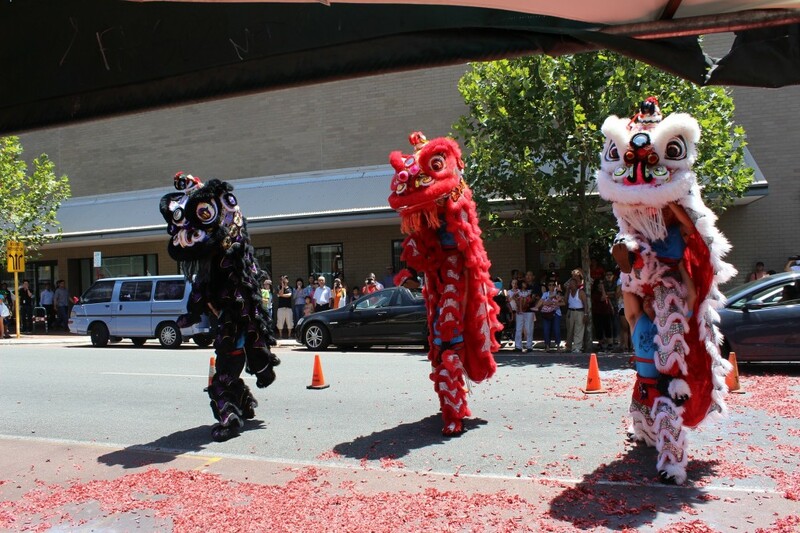 After the emotional ceremony, all members of the CCC Lion Dance Family lined up in front of Robbie and bowed to him. The opening of Robbie’s lion is significant as it symbolises his lion spirit brought to life, where it will live forever. Robbie’s love will live forever and to show their love for Robbie, members of the troupe all wear the I RC I arm band, and their singlets having the I RC I initial by the heart area. This symbolises that Robbie will always be in our hearts, and through our strength each performance will be in memory of you. Robbie Chau, the CCC Lion Dance Family love you, and will never forget you. We all miss you deeply. Forever you will be in our hearts Brother.